On April 23, 2016 I participated as a director in Chickspeare's 24 Hour Play Festival. The final performance was at 8:00pm in the NoDa Brewing taproom. Method, a one-act play, received a staged reading in Colonial Little Theatre's New Play Festival in Johnstown, NY on May 9th and 10th alongside four other one-act plays. It was directed by the playwright and starred Capitol Region talent Melissa Capone, Ed Miller, Faith Barlow, Christian Rohrs and George Carter. The play follows a young actress as she takes her commitment to the craft to a dangerous place, not just for herself, but for those around her. Why? Because it's a "theatre" thing? Yes! That's exactly why. This is my job. And I need to do it well in order to keep doing it. It has nothing to do with how I feel about you. I know. That's the part that hurts the most. I'm sorry you feel that way. But I was desperate. And they were counting on me. I couldn't let them down. I just couldn't. 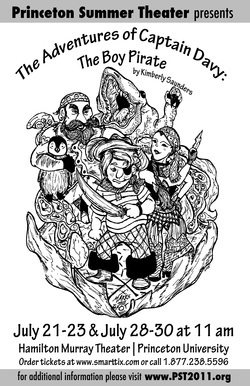 The Adventures of Captain Davy: The Boy Pirate opened July 21st at the Hamilton Murray Theater directed by Princeton resident Kathryn Rickman. Once again the members of the Princeton Summer Theater company provided an ensemble of laughs and adventures for children of all ages. When asked what their favorite part of the show was nearly every child responded, "the sword fighting!" This tale of lost treasure and companionship takes a little bit of life's lessons and mixes them in with pirates and a LizardSquid. It's not worth risking your life for some broad. I am not a broad! You're a girl ain't ya? I'd rather be a girl than a pirate with penguin. 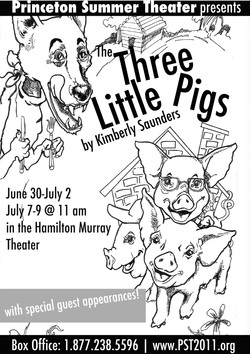 The Three Little Pigs opened June 30th at the Hamilton Murray Theater at Princeton University. It was directed by Princeton alumni Adam Zivkovic and starred various Princeton Summer Theater company members and interns. This modern, comedic twist on the classic fairy-tale received several large audiences of laughing children who enjoyed both the hilarity of the unfortunate wolf and the audience interaction. Some a little more ambitious than others. 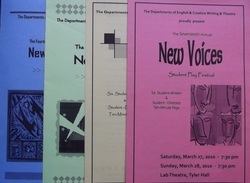 The SUNY Oswego New Voices Playwriting Festival is an annual competition offered to undergraduate students interested in the process of workshopping original dramatic works. Kimberly Saunders is the first (and possibly only) female student to be named a finalist four years in a row. Her featured works include A Time to Grieve, Once Upon a Happily Ever After, What Are Sisters For? and Oh, Life. Each of these ten-minute plays received scheduled rehearsals and a weekend of staged readings. Kimberly was also involved with the festival as an actor, director and event coordinator. Due to her involvement with the festival, an article was written for SUNY Oswego's website, which can be found here.